This column is a cheap shot. Or maybe not. You decide. It pivots on Defense Secretary Jim Mattis, and something he recently did—and, more importantly, something he didn’t do. The newswires crackled July 24 after the Pentagon gave them an early peek at the scolding Mattis issued to Pentagon weapons buyers for spending more than $28 million extra on proprietary Afghan camouflaged uniforms (generating a bonus for its private designer), rather than cheaper camo designs already hanging in the U.S. military’s closet. What we really need from our defense leaders is judgment, and an ability to stop sleepwalking through momentous decisions that often can’t be undone. The press gobbled it up. The New York Times said Mattis “sharply criticized” the Pentagon brass for its dumb purchase, uncovered in a report by John Sopko, the Special Inspector General for Afghanistan Reconstruction. “Mattis targeted the Pentagon’s bureaucracy,” the Washington Post added. USA Today said the defense chief had “blasted” his minions. But Mattis’ walloping them for this is like shooting fish in a barrel. With a nuclear weapon. I’ve covered Jim Mattis for years and believed him to be a fine officer with the potential to become a great defense secretary. But squawking about this snafu is decidedly small-bore: any sentient human being knows it made no sense. What we really need from our defense leaders is judgment, and an ability to stop sleepwalking through momentous decisions that often can’t be undone; the kinds of things many hoped Mattis, given his stature and smarts, would put the kibosh on. While Mattis spanked his procurement czars July 21 for their fabric faux pas, he let the Navy, the very next day, get away with what the Pentagon’s former top weapons buyer likely would have called “acquisition malpractice.” Frank Kendall coined the term in 2012 after the Air Force, Marines and Navy decided to begin producing F-35 fighters while the government, and builder Lockheed Martin, were still developing it. Video of the commissioning posted by the White House on July 23. The Ford isn’t just another in a long line of proven cookie-cutter carriers. It is the namesake and first of the Ford class, crammed with new, and unproven, technologies that makes the Navy’s commissioning of the carrier rather like buying a pig in a poke. The last time the Navy launched a new class of carriers—the Nimitz class, 40 years ago—the service operated Vought A-7 Corsair attack planes, Grumman KA-6D tankers, McDonnell Douglas F-4 Phantom II fighters, RA-5C Vigilante spy planes, Grumman EA-6B Prowler electronic-warfare planes and Grumman E-2 Hawkeye early-warning aircraft from its deck—all before the Navy commissioned it. Five days following the commissioning, on July 27, a Navy spokesman confirmed that no takeoffs and landings had occurred on the Ford. When might they take place? “We do have a timetable for testing the ship's systems,” he said, but “operational security” kept him from providing details. The next day, July 28, a Navy F-18 pilot landed and launched from the Ford for the first time using the carrier’s new systems. The Ford’s new technologies include plane catapults powered by electricity rather than the traditional steam, and turbo-electric systems designed to bring landing warplanes to a swift and safe stop on the flight deck. 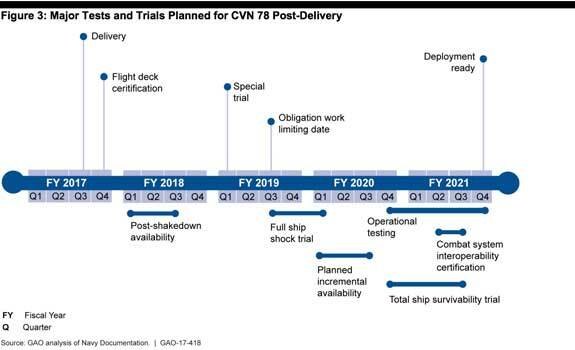 The Ford’s development is so molasses-like that the General Accounting Office estimates that it will take another four years—nearly 10% of the carrier’s expected life—before the vessel is ready to sail in harm’s way. In keeping with the nation’s Potemkin sense of civilian control of the military, the Navy is pressing ahead with the more modern catapults. Yet the U.S. Navy has just tossed the tried-and-true condition-based logic overboard when it commissioned the Ford before a single airplane has been launched from it, or landed on it. Not to put too fine a point on it, but isn’t that what aircraft carriers are for? What’s really going on here? Beyond making for a fine final day for Trump’s “Made in America” week, the Navy accepted and commissioned the ship early to avoid breaking a cost ceiling on it imposed by Congress. “It is now using operations and maintenance dollars to repair a new ship,” says a long-time Navy officer, now retired. Not only isn’t the Ford ready for war, its use of O&M dollars to make her shipshape is sucking money from the Navy’s 10 other carriers, reducing their readiness. The key question, which has affected a lot of military procurements in recent years, is: why the rush? As stewards of taxpayer funds, why does the Navy want—and Mattis allow—the commissioning of a new class of aircraft carrier before a single flight to or from its deck? Given growing concerns that such 100,000-ton behemoths may be vulnerable to enemy missiles, one might think a go-slow approach makes more sense. The Pentagon dismisses such concerns. This commissioning, its enablers will say, is merely symbolic, despite the word’s historical meaning inside the Navy. But that doesn’t mean the rest of us—taxpayers, sailors, and yes, most importantly, Defense Secretary Jim Mattis—have to accept it.